Can a Christian Be Angry At God? Is it a sin to be angry with God? What does the Bible say about anger toward Him? Are there exceptions? There is a time to be angry and it is when you see an injustice or a violation of the law so there is nothing wrong about getting angry over something that is deplorably wrong. One example is that of a child being abused. God is most certainly angry over this and would expect us to do something about it. Jesus got angry too. Listen to what happened when He saw what the money changers were doing at the temple. Those who came from far away for the Passover obviously couldn’t bring their sacrificial animals with them like lambs, so they came to the first part of the temple and bought animals for them to sacrifice. What they found were over inflated prices for the sacrificial animals, cheating on currency exchange, diseased or blemished animals, and they exploited the poor who could only afford to buy a sparrow or a dove. When Jesus saw this, He was incensed and He cleansed the temple. There were actually two times that He did this, once at the beginning of His ministry and once near the end of it. In John 2:13-16 we read that “Jesus went up to Jerusalem. In the temple he found those who were selling oxen and sheep and pigeons, and the money-changers sitting there. And making a whip of cords, he drove them all out of the temple, with the sheep and oxen. 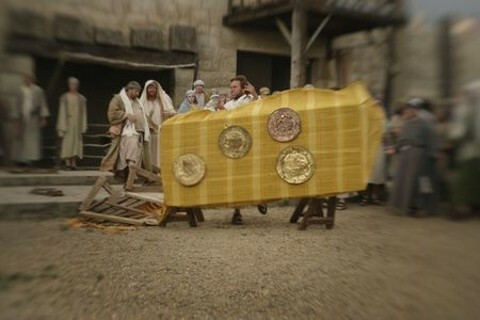 And he poured out the coins of the money-changers and overturned their tables. And he told those who sold the pigeons, ‘Take these things away; do not make my Father’s house a house of trade.’” Picture this in your mind. Jesus was meek and mild, yes, but He was also firm when there was the need to be. He made a whipping cord, turned over the tables, and ordered these thieves out of the temple. He was not shy about cleansing a place that was supposed to be Holy. Paul obviously had heard about Jesus’ confrontation with the “den of robbers.” He also understood that God gets angry at sin. He wrote to the Ephesians to “Be angry and do not sin; do not let the sun go down on your anger” (4:26). What is interesting here is that he said this in an imperative form of the Greek. “Be angry and do not sin.” It is a command. So you can be angry and it not be sin. The point is it isn’t sin when you get angry for the right reason…and if you do get angry, get over it…at least by sundown (Eph 4:26). If you don’t, you open the door for the Devil (Eph 4:27). This doesn’t mean that you need to get rid of the anger at the exact moment that the sun sets. What Paul means is that don’t let your anger linger. Get angry for the right reasons, like in Jesus’ case, and then let this anger subside. Ultimately, God will avenge all wrongs, including those done to His own people (Luke 18:7). Can We Be Angry at God? The Old Testament has an account where David got angry at God but he is not the only one that does. In 1 Chronicles 13:9-11 the Ark was returned to Israel when “Uzzah put out his hand to take hold of the ark, for the oxen stumbled. And the anger of the Lord was kindled against Uzzah, and he struck him down because he put out his hand to the ark, and he died there before God. And David was angry because the Lord had broken out against Uzzah. And that place is called Perez-uzza to this day.” David was angry that Uzzah was killed but the fact is that they were not treating the Ark in the way that it deserved to be treated…with holiness and respect. For one thing, they were moving the Ark, which represented the presence of God, on an ox cart. It was supposed to be carried by priests and by using poles so that no one would touch it. David got angry that someone died from an accidental touching of the Ark but instead he should have realized that they were caring for the Ark in an irreverent manor. The fact is that David felt forsaken by God (Psalm 22:1) Jeremiah felt deceived (Jer 20) and Job felt abandoned (Job 23:1-15). Maybe you’ve been angry at God. It is okay to get angry at God. God will not strike you dead for that…but the fact is that you should not stay angry at God. Instead of asking God why, we should ask God what. What are you trying to teach me God? To be angry at God is not sin but to remain in a constant state of anger will not solve anything and God deserves our respect, our reverence, and our thanks because He is truly kinder to us than we deserve. God is angry at sinners and is angry at the sinner every single day (Psalm 7:11). God is so angry at sin, He was willing to have the wrath of God that we deserved placed on His innocent Son, Jesus Christ. He became sin for us and since the wrath of God is evident against sin (Rom 1:18-32), God could not just look the other way. He had to punish wrongdoers but for those who have repented and trusted in Christ, His wrath has been satisfied in Christ, the Passover Lamb of God (1 Cor 5:7). Believe on Him and you will not be condemned on that day of Judgment (Rev 20:11-15) or reject Him and face the full fury of His wrath someday (John 3:36). You have a choice to make. His anger against your sin is appeased in Christ (John 3:16) or you will have to bear it yourself (John 3:17-18). Related reading: Can a Christian be Angry and Not Sin? Hello, Pastor Jack! How are you doing today? 😀 I found your conclusion quite eye-opening. I used to think it was dangerous to be angry at God, but maybe that is because people usually get angry for either the wrong reason or because of a misunderstanding. Also, every dispute God has had, He has quickly or eventually won. Maybe people who think it’s dangerous are just scared of being humbled before the Almighty? But now, what you have said has comforted me. Thanks! I think you’re onto something brother…that many people fear God after being angry at Him but it is because we don’t understand what He is doing and that is usually the primary cause. Hurt people sometimes react in anger even on the human level but I think the only real problem is that if a person remained and stayed angry at God and it was never resolved. Good article Pastor Jack, it opened my eyes too. It is the staying in anger that is the sin. I used to be under the impression that whenever something bad happened to me, it was The Lord punishing me for something. It took a long time before I got over that, and realised that God truly does love me, and He chastises those He loves. Thank you so much David, always the encourager, and you live out Romans 12 and 1 Cor 13 to my perfectly. Thank you. Hello Pastor. How have you been doing? To set your expectation, my comment is, again, gonna be very long. I apologize. I would just like to share with everyone how this article has enlightened me. I cannot deny the fact that I was once angry at Him; not once, twice or thrice. My reasoning then was that I am not as great as the other believers (both beyond and at our time), yet He permits trials and hardships in my life. Trials that are strong enough to tear me apart. Failures that almost took away my faith in His promises. Disappointments after disappointments that made me think that I do not exist here for a purpose. Good thing is that His unconditional love has brought my focus back to Him. And I know that He is preparing something spectacular in my life. I cannot deny though that there is still resentment inside my heart; though the difference now is that I can handle my anger with maturity, by His grace. I do not question His will for my life anymore, though I have so many questions. I do not complain anymore too; just acknowledging the pain, then not allowing it to get the best He has for me. (I always tell Him to forgive me if somehow I get angry at Him for what He permits in my life everytime I pray). And I guess this applies to all kinds of relationships; that is the one you love the most who can make you so angry. The one that could hurt you the most is the one that you love. I can definitely say that I love Him so much; that is why it really pains me everytime disappointments, pain, failures come my way. What comforts me is His promises and His everlasting love. And once I am over it, I just find myself rejoicing and thanking Him; believing in His perfect design for me. I would definitely understand if you think that I am so weird in handling my ordeals. I am not encouraging everyone though to feel the same way at Him everytime something bad happens. I am not persuading people to have the same mechanism as mine because I know that there might be something wrong with it. And I always ask for His forgiveness everytime I do so because I know, in one way or another, some of my disappointments and failures are the consequences of my wrongdoings in the past. And I am the one to blame for it. What hurts me the most right now is the circumstances that suddenly come my way that I know I should not be dealing with. And my own version of “thorns in the flesh”, I guess. One great thing is that I am okay now. Back on track again. I just reflected on His latest revelation to me via the whole chapter of John 16. He told me that life with Him and for Him is not going to be easy. But at the end of it all, once all my hardwork, perseverance, dedication, patience, and love pay off, I will be able to forget all the hardships that I have had to go through. There must be really something so spectacular that He is going to do in my life, I guess. May we all continue to stay in His eternal lovingkindness. Awesome comment my brother. I believe your testimony will help many who have gone through similar circumstances my friend. At one time we were all enemies of God and hostile, wicked sinners (Rom 5:8, 10) which shows how amazing God’s grace really is. I thank God for you my beloved brother. Thank you. Thank you too, my brother. Hearing your comment makes me feel that I am really able to deliver the exact message that I want to. I weep, I hurt, I fall. But once I get up, I can sing, dance and rejoice in the midst of His presence. Thank you too, my brother. Hearing your comment makes me feel that I am really able to deliver the exact message that I want to. My testimony is about the ordeals that I experience NOW. But true enough that through God’s grace and lovingkindness, which is always brand new everyday (thank God for if it’s not, that is the end of me), I can rejoice and celebrate in the midst of severe trouble, pain, frustration, and failures. It is not impossible for us to sing and dance in our darkest hours. He is with us always. I just tell myself that to mourn in the midst of sadness is a blessing. It makes me human. I am able to experience all kinds of emotions. And most of all, His strength is really designed to work in us when our strength fails. And maybe one day, when His perfect design for me takes place, there might be nothing more than joy, fulfillment, sense of achievement, and all the best things life has to offer. My own “heaven here on earth” is to come. It is really my great joy to communicate with y’all. And I am also praying and declaring joy and love in your life, Pastor Jack. And for all of our brothers and sisters, let us continue enjoying His love. His love that never runs out, never fails, never ends, and never changes. Thank you for this article. I’ve been reading different articles on your site because I have been looking for some insight into a better understanding. The past 7 years have been so awful and though I have been keeping communication with God, I have now recognized that I have been angry with God, some misplaced, some placed with reason. Although God sees my heart, soul, all I’ve endured, and my thoughts, prayers and confessions (for anything I’ve done wrong, sins, shortcomings, unintentional stuff etc), I have forgotten to ask for forgiveness for any anger unto Him. I have forgotten that though he sees and knows all, I’ve forgotten to apologize and ask for forgiveness when I am upset with Him. I am thankful for it all, the good, blessings, the lessons and the bad times. I think in order to have a better relationship with God that we need to acknowledge even when we are angry with Him and why, to work it out with Him even though He sees and knows all. God may understand our heart, soul and thoughts, but to not express what we think may be inexpressible may block our close connection with Him. Not having that connection leaves us vulnerable, right? When I read this article, I was flooded with tears and that is when I realized…….Thank you again, for your site and information. It was a light I needed in my dark time….many blessings and much love. Thank you Light. What a powerfully moving comment. You are such a blessing to read. This brought me to humbleness too and yes, not having a connection does leave us vulnerable. Great point. I hadn’t thought of that. You are right. May God richly bless your walk with Christ my friend in Christ. What a privilege to know such a believer and read their (your) beautiful testimony. Thank you, Jack for your comment. It was this article, 7 tips for the Christian Dealing With Heartbreak, and Why Bad Things Happen to Good People that has brought me to my knees once again for the probably millionth time in still dealing with all my life’s courses/storms. I’ve been through so many aspects to not only reconcile my past all around, and to be brave to face whatever future God has planned for me for my greatest good in His plans. It is often difficult for us to understand why things happen or why what you think is a good path for yourself ends, and for me so terribly that I’ve lost “all” again to start my life over and over, that even I feel guilt for “questioning” the why’s and what does He want me to learn. I even feel guilty for having those questions and feelings. I’ve even prayed much of the day for forgiveness for that to God; I just don’t understand my suffering. Your writings have reminded me that some of those why’s are part of the bigger picture that sometimes we are not meant to know, but to trust in His will and life path for each of us and sometimes when life continues to be difficult, that we still turn to Him and ask for help wherever we may need it; overall, to trust that someday, the outcomes will be better, regardless what those outcomes are. I don’t need proof to know God exists, for my heart and soul already knows that answer and I have known that answer all my life. I share it under the “right” circumstances. I even helped my own father reconcile his life and believe in God’s plans for him. God has allowed me to live three times I faced death in this lifetime alone. One, the day I was born, I was premature by two months in 1970 and I was not expected to make it through the night. I defied all doctor’s expectations and not only survived, I developed normally when they thought I wouldn’t. Two other times was an accident and a surgery where I wasn’t expected to walk again or heal with the best of outcomes and I did both times, by the good graces of God. In all cases, the doctors and others believed they witnessed a miracle. I doubt God saved me this many times to make me suffer alone or without good reason, for when people have a belief in Him is reason enough for me- compassion/love is another that I need no explanation or reason. I believe He has a life and a plan for me that is better than what would have been had the other stuff worked out, whatever my greatest good is not only for myself but for all those I interact. And so I believe, I must be patient and continue to learn and grow and believe in Him that no matter what, things will work out somehow and God will make it so somewhere, someday, somehow. Your articles reminded me of this, as I did lose sight through these experiences. I mean it when I say, thank you for being a light in my darkness. I feel a peace that I have not felt in a long time…..
God has plans for you I am sure after all that you have endured my friend. I can’t wait to see what that is. May God richly bless you Light.